Like many sweet lovers in Franklin County, Massachusetts, I make a pilgrimage each year in June or early July to Richardson’s Candy Kitchen in Deerfield for chocolate-covered strawberries. The store indicates that the strawberries have arrived by setting a giant fake fork spearing an equally fake strawberry on the front lawn. 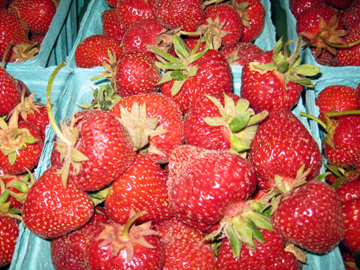 The strawberries at Richardson’s are delectable. They feature a layer of filling between strawberry and chocolate that is particularly appealing. Of course, these treats have to be eaten within 24 hours—but my family never seems to have trouble with that rule! The version below omits the filling since I have no idea how Richardson’s manages to put it inside the chocolate. The recipe merits making nonetheless. How can you go wrong with strawberries and chocolate? I apologize for the vagueness of the list of ingredients. Basically, one uses as much chocolate as one likes (or has). I had a lot so I used about 1-1/2 to 2 ounces per strawberry, which was definitely excessive. Since I only make these treats once a year I don’t mind a little excess. But you may definitely use less chocolate than I did. Gently rinse the strawberries and drain them thoroughly. While the water is coming to a boil, chop the chocolate into small fairly uniform pieces. Turn off the heat below the water, and place the chocolate in a pan or bowl on top. Stir the chocolate as it melts over the hot water. When the chocolate has melted, remove it from the water, carefully wiping the outside of its bowl or pan. Let it cool for a few moments so that it won’t make your strawberries go bad before you get a chance to eat them! Carefully dip each strawberry in the chocolate, holding it by the hull. Place the covered strawberries on a silicon- or wax-paper-covered plate to cool. As soon as they are at room temperature either eat them or pop them into a covered container to cool in the refrigerator until you are ready to eat them. This entry was posted on Wednesday, June 16th, 2010 at 4:00 am	and is filed under Candy and Fudge, Strawberries. You can follow any responses to this entry through the RSS 2.0 feed. You can leave a response, or trackback from your own site. Chocolate covered strawberries are one of my absolute favorite treats – especially with fresh-picked local strawberries! Making them is also a family-fun activity. Yours look fantastic! All right, I did indeed wake in a grumpy state (and Connecticut, too, which only made it worse). I have no quibble with the recipe for chocolate covered strawberries per se, but recoil at the omnipresent idea itself. One can order these things online – they’re advertised on television and shown to be (apparently) steroid-enhanced red masses covered in a thick brown casing. They’re intended to be tributes to one’s mother or love interest. to continue: Is this faddish concoction the final evolution of some preposterous (but clever) idea Martha Stewart put forth in one of her early wedding books? And must it usually be done so badly? Classic strawberries and clotted cream is the apotheosis of summer civility with a heady undercurrent of indulgence and sensuality. Perfect for the Queen’s garden reception. 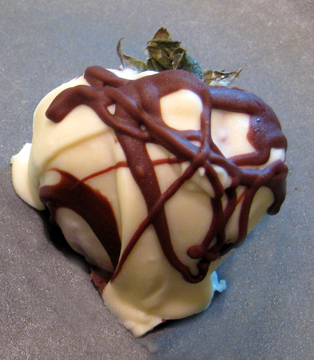 Strawberries-drowned-in-chocolate is a has-been Las Vegas casino. Only one thing is worse and that is the advent of the tiers of liquid chocolate cascading ominously at wedding receptions. This is the sort of nonsense that would appeal only to the poor, addled bride and the underage ring bearer and flower girl, and were I the groom, I’d bolt from the reception and hope my Blackberry (free of chocolate coating) could reach a good divorce lawyer as he approached the eighteenth hole. As children we were offered three basic flavors, with the occasional, seasonal flavor made available for a limited time each year. Neapolitan ice cream offered the thrill of having one’s cake and eating it too, so to speak (for a metaphorically-challenged child). More discerning children quickly learned that it was best to pick a favorite and eschew the melted Neapolitan muddle of three flavors coalescing into a pinkish brown puddle. Wise children we were. I like licorice and I like bananas and I see that they keep their distance. Pistachio ice cream with peanut butter sauce is an entirely different and private matter. Oh dear – I have to admit to being a very bad girl – I melt my chocolate in the microwave – although you have to be careful not to overdo it or it goes grainy!! I love strawberries dipped in chocolate – and if Flaneur wants to taste a real delicacy, he or she (sorry don’t know which) is very welcome to come and stay with me to taste Scottish strawberries, which are possibly the finest strawberries in the world – and our raspberries are even better!! ps – I guess I can share Bruce, Robert and George with you!! Found you via the MHC Alum recipes site. I’m class of 2006 what about you? Anyway, this recipe looks delish, how could it not right? Damaris–My graduation year changes annually so I can stay 39. I am, I have to admit, a teensy bit older than you are. But I can see from your blog that you are a sister in food as well as college…..
Yum. Another winning posting. I think this delicious meeting of chocolate and strawberry is really great. Thanks for sharing! I have to agree with you there, Elizabeth. It’s a pairing that’s hard to resist!